The global biomethane market was valued at around US$ 3 Bn in 2017 and is anticipated to expand at a CAGR of more than 7% from 2018 to 2026, according to a new report titled ‘Biomethane Market - Global Industry Analysis, Size, Share, Growth, Trends, and Forecast, 2018–2026’ published by Transparency Market Research (TMR). Biomethane plays a key role in the development of local circular economy by reducing greenhouse gas (GHG) emissions; improving waste management; preserving soil quality and water tables; and creating jobs. According to ADEME (French Environment and Energy Management Agency), by 2030, there would be between 500 and 1,400 sites injecting biomethane in the network, with biomethane gas energy accounting for 16% of gas in the network. Rise in environmental protection regulations across the globe prompt the power generation industry to opt for cleaner and eco-friendly energy resources. Major economies across the world are focused on developing renewable energy generation to reduce their dependency on conventional power generation that requires fossil fuels. Records of investments in renewable energy indicate that the dependence on coal and other fossil fuels is reducing worldwide, due to the rise in investments in solar, wind, and biomass energy. Biomethane is a major source of renewable energy, which can overcome several global challenges such as limited availability of fossil fuel and environment-related issues Biomethane can be injected directly into the existing natural gas networks; therefore, it can be used as a substitute for natural gas in internal combustion engines without the fear of corrosion. Hence, most countries are considerably investing in the biomethane market. This, in turn, is likely to drive the global biomethane market during the forecast period. More than 300 new biomethane plants were built across Europe between 2012 and 2016. Among production methods, the anaerobic digestion segment dominated the global market in 2017. It is the most commonly used method of producing biomethane. It is the process wherein organic matter such as animal or food waste is broken down to produce biogas and bio-fertilizers. This process takes place in the absence of oxygen in a sealed, oxygen-free tank known as anaerobic digester. The Low-carbon Fuel Standard Directive (2009/30/EC) is an amendment to the Fuel Quality Directive (1998/70/EC), which calls for 6%–10% decrease in greenhouse gas intensity of fuels used for road and inland waterway vessels by 2020, over that in 2010. This can be achieved by increasing the share of renewable fuels or low-carbon fossil fuels in the total energy mix. The EU Renewable Energy Directive 2009/28/EC, with an Indirect Land Use Change (ILUC) amendment (EU) 2015/1513 approved in 2015, sets binding targets for member countries regarding the share of renewables in the total energy and transportation mix. Biomethane is also counted for these targets. Among applications, the heat generation segment dominated the global biomethane market, holding more than 40% share, in terms of value, in 2017. The segment was followed by the electricity generation segment. Biomethane has heat capacity of about 130 BTU/gallon, which is equivalent to about 1,000 BTU/scf. Biomethane is a gas with high calorific value. Due to this high energy content, biomethane is used in industrial and commercial applications. The alternative fuel segment is expected to expand at the maximum CAGR during the forecast period. Europe dominated the global biomethane market in 2017. Germany is a major consumer of biomethane in Europe. The country accounted for more than 60% share of the market in the region in 2017. The U.K. and Sweden are other major markets for biomethane in Europe. The U.K. has almost 90 plants injecting biomethane into the gas grid to date. The country is also investing in new biomethane projects. By 2020, around 48 new biomethane plants are set to be built in the U.K., with an investment of up to EUR 455 Mn. In Sweden, more than 60% of biomethane produced is used as a transport fuel. The global biomethane market is highly fragmented. A large number of local and international players provide biomethane services. 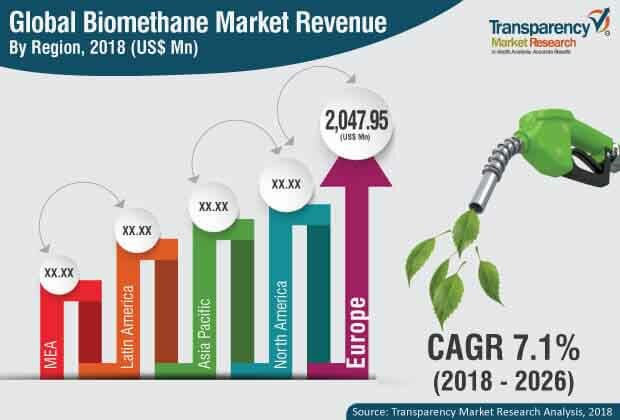 Key players operating in the global market are EnviTec Biogas AG, VERBIO Vereinigte BioEnergie AG, Future Biogas Limited, CNG Services Ltd, PlanET Biogas Global GmbH, Gazasia Ltd, Landwärme GmbH, Qila Energy, Evergaz, WELTEC BIOPOWER GmbH, ETW Energietechnik GmbH, and StormFisher Environmental.